Their paycheck breaks down how much they contribute for medical, dental, 401(k), but they don’t often see the other side – how much the employer contributes! Or just how much their other “hidden” benefits (those not on a paycheck) are worth. Benefits make up approximately 30% - 40%* of an average employee’s compensation. 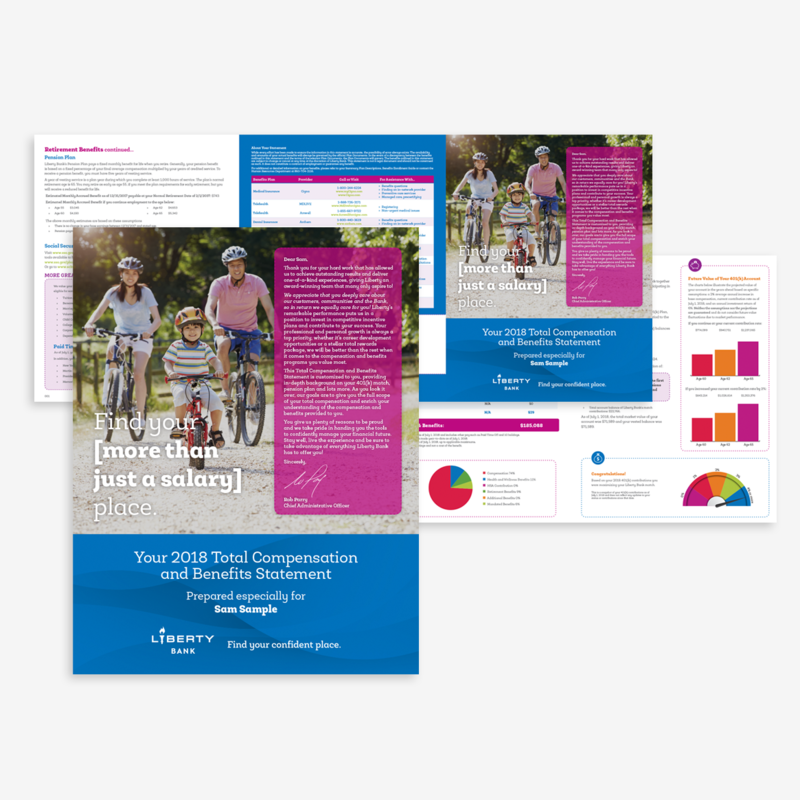 Total compensation statements are a great tool to educate employees about that “hidden paycheck.” There are many unique ways that companies compensate their employees – whether it is on-site child care, gym memberships, tuition reimbursement, transit and parking allowances, vendor discounts, etc. These benefits present valuable cost savings as well as save time, relieve worry and stress. It can be difficult to attract and retain talent, so by communicating the value of total compensation employers can make a powerful statement that could impact employee morale and retention. A personalized benefit statement can reinforce your commitment to your employees by showing the true value of their position within the company. Showing accrued and projected retirement benefits can also help employees with financial planning. The more you can personalize the statements, the more meaningful they will be. However, be sure the data is presented in a way that is accurate, consistent and understandable. Need variable text for a varied workforce? It’s possible! You can customize what charts, data, and verbiage appears, dependent on the employee. Are they more visually-minded or analytical? Would they love pie charts and figures? Graphs and charts easily convey data. Or, do they like it clean and simple? Use bold graphics and images to make it pop! You can customize the look and feel to promote your brand. How do your employees like to receive information, online or print? Knowing your audience will help you determine the level of detail and best delivery method for your statement. Online statements can often be integrated with your benefits platform – and can be easily accessible, interactive and can even include modeling tools. They allow employers to update them easily and monitor usage through analytics. However, some clients still prefer a well-designed printed statement mailed to employees at home. A colorful print statement can have perceived value and can easily be shared with family members. Print statements can range from simple one-page summaries to multi-page booklets complete with an intro letter and colorful charts and graphics. This is your opportunity to highlight the true value of ALL benefits (not just compensation) and highlight those that are underutilized. Be sure to show both the company and employee’s share in the cost of benefits, and include the value of paid leave and other lesser-known perks. Statements are an effective way to underscore the high cost of health care – and the significant contribution made by the company. Consider including benchmarking information. If your company provides better than average health care benefits, a robust leave program or a stellar 401(k) match, show how you compare to the competition. Total compensation statements can provide a significant return on investment (ROI) – through increased employee engagement, retention and greater appreciation. Make the most of the investment you make in your employees and help them discover their “hidden paycheck”. Employees that see their value and feel appreciated are more likely to stay with your company and promote you to others, helping to attract new candidates.